Steam Club: Ready, Set, Grab! This story time is a weekly program that includes longer books, songs, fingerplays, and flannel board stories and is designed for 3-5 year old children and their parents. This is a 45 minute program that includes a simple craft. The Mobile Career Center is a self-contained vehicle equipped with state-of-the-art telecommunications equipment capable of being deployed inside or outside of the vehicle. 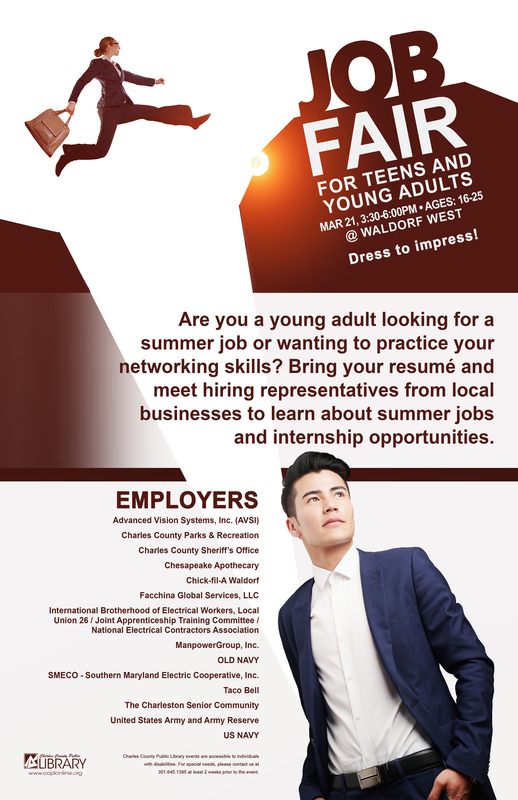 It allows the JobSource to offer a full array of employment, reemployment and employers services on the go. The Mobile Career Center contains a Greeter Workstation, a Resource Area, Employee Workspace and a Confidential Interviewing Space; Computer workstations and one computer server with the ability to accommodate additional people, through the use of wireless laptops that have Internet Access. The Mobile Career Center is ADA accessible with a working wheelchair ramp providing access for those with limited mobility. Recommended for age 18+. Join us for fun, learning, and socializing as we explore STEM themes. In April we will be learning about the science of sound! Let's learn Spanish together! 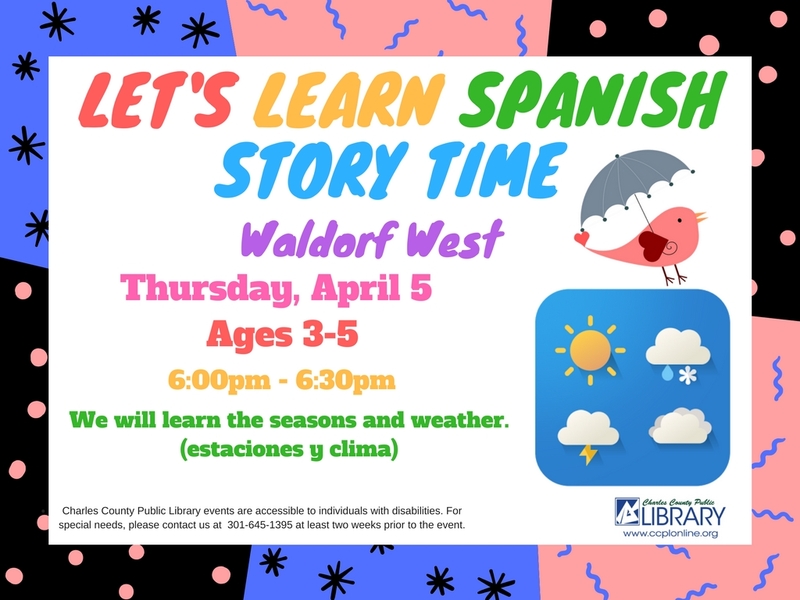 Enjoy an English based storytime with some added Spanish words and watch as our Spanish vocabulary grows. We'll read books, sing songs, dance and make a craft. It will be fantástico! Recommended for ages 3-5. In April we will add picnic words to our vocabulary. Join us for an evening of crocheting, knitting and socializing with other beginning and advanced crafters. We will share basic stitches and techniques to help you begin your crochet and knitting journey. All participants must bring their own yarn and needles. Recommended for ages 9 and up. Life following sexual assault or domestic violence can feel troubling and at times hopeless. This discussion is aimed to promote awareness around common side effects following trauma in order to gain a deeper understanding of what a person may be experiencing after being victimized. We will also discuss some resources that are useful with coping. Presented by Center for Abused Persons. 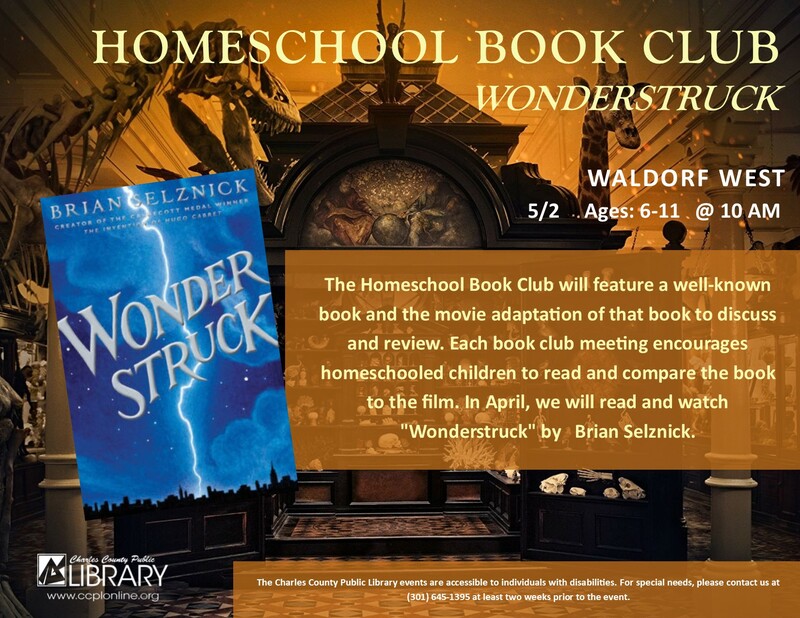 The Homeschool Book Club will feature a well-known book and the movie adaptation that homeschooled children are encouraged to discuss and compare. Recommended for ages 6-11. In April we will read Peter Pan by J.M. Barrie and watch the 2003 version of the movie. Make a colorful and whimsical painting in the library. Hear from Homer Price for inspiration. Take the fruits of your labor home to enjoy. Those who attend will leave with a better understanding of what the law says about citizens' rights, their obligations, and the legal process following a traffic stop. We will start with a brief introduction of the panel of experts from the Sheriff's Office, State's Attorney, and the Office of the Public Defender. Each panelist will discuss their role process with an emphasis on what the law states, common misconceptions, and explanations of misunderstood terms like probable cause, reasonable suspicion, citation, custody, arrest, and lawful search. We will end with a Question & Answer period so you can ask county representatives your traffic stop questions. Join us in creating fun cherry blossom inspired art using paint, paper plates, and tissue paper. Recommended for ages 6-11. 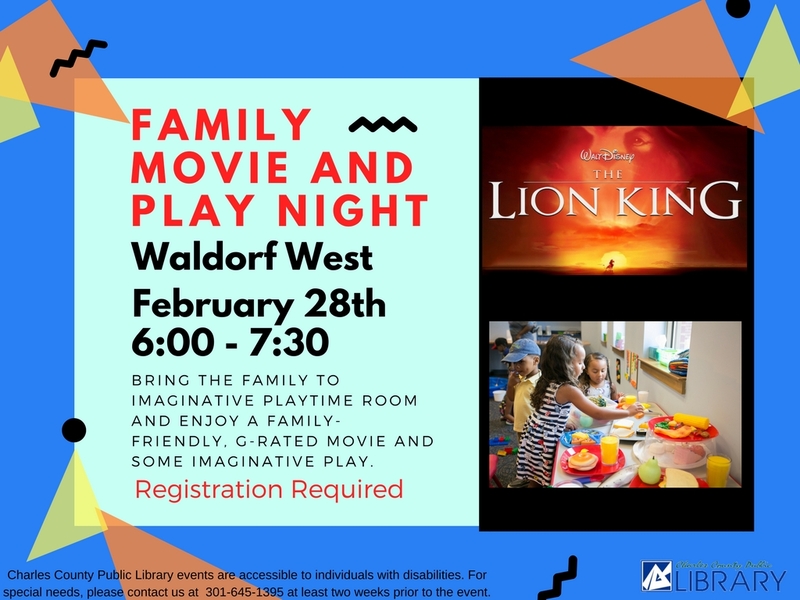 Bring the family to Waldorf West's Imaginative Playtime Room and enjoy a family-friendly, G-rated movie and some imaginative play. One ticket per person (even infants) will be handed out one hour before the program. Children under 8 years of age must be accompanied by an adult at all times. In April we will watch Disney's Tarzan. Recommended for ages 0-5. Create awesome things with Lego blocks! Work together in teams or on your own then share your creations with the group! This program for ages 5-14 lets them read to a furry friend who is a great listener. Improved reading skills and confidence are the goals. All dogs are certified therapy dogs. Recommended for ages 5-14. Please register. Spend family time together creating simple craft projects. This month we will do a rainbow collage. Once a month the U.S. Department of Veterans Affairs Readjustment Counseling Service Mobile Vet Center will visit the Waldorf West library to provide services for our country's veterans. Readjustment Counseling Services such as individual, family and group counseling, bereavement counseling, military sexual trauma counseling, outreach and education, substance abuse referrals, employment referrals and VBA explanation and referrals will be available to eligible vets. Stop by between 10 am and 3 pm to take advantage of the free, confidential services offered by the Mobile Vet Center. Recommended for ages 18+. This story time encourages emerging literacy skills through books, songs, fingerplays, and flannel board stories. It is designed for children of multiple ages and their parents. This is a 30 minute program that includes a simple craft. Celebrate Earth Day by creating bird feeders out of vegetable spread and bird seed. Recommended for ages 2-9. Make your own zoo animal out of popsicle sticks.Take your zoo home to let your imagination run wild! Learn about the importance of pollination while making your very own buzzing bee robot! Recommended for ages 6-11. Put some spring in your step by spending an evening with ballet dancers! We will ask both male and female ballet dancers questions as well as learn new moves! Recommended for ages 5-11. This will be a ticketed event. The Humane Society of Charles County invites participants to learn to be "forensic" investigators by observing skulls of animals to discover characteristics that will reveal whether the animal is herbivore, carnivore, or omnivore. The size, shape, teeth, brain size, and nasal cavities give clues about the habitat and life cycle of native Maryland species. Recommended for ages 9-14. The Charles County Public Library partnering with Lifestyles of Maryland Foundation, Inc. will make the library's public showers available to individuals who are homeless or need to use the showers. Individuals are welcome from 9:30 a.m. to 12:00 p.m. *Pre-registration with Lifestyles is not a requirement. Please note the library is closed to the public during this time. Recommended for all ages. Drop in and share the excitement and love of reading with your child by joining us in story time. Each story time will include reading books, dancing & music, and a hands-on activity or craft. Learn 3D printing basics and get your very own object printed for you! Due to printing time objects will be printed by staff after the program and you will be notified when ready.